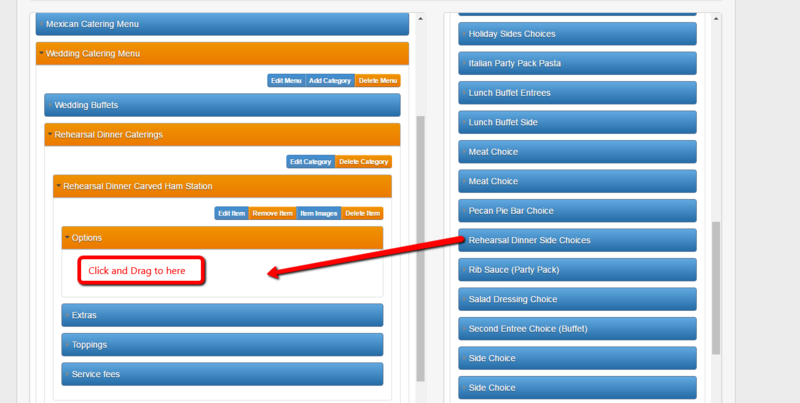 In this article we will go over how to create Menu Items Add Ons . 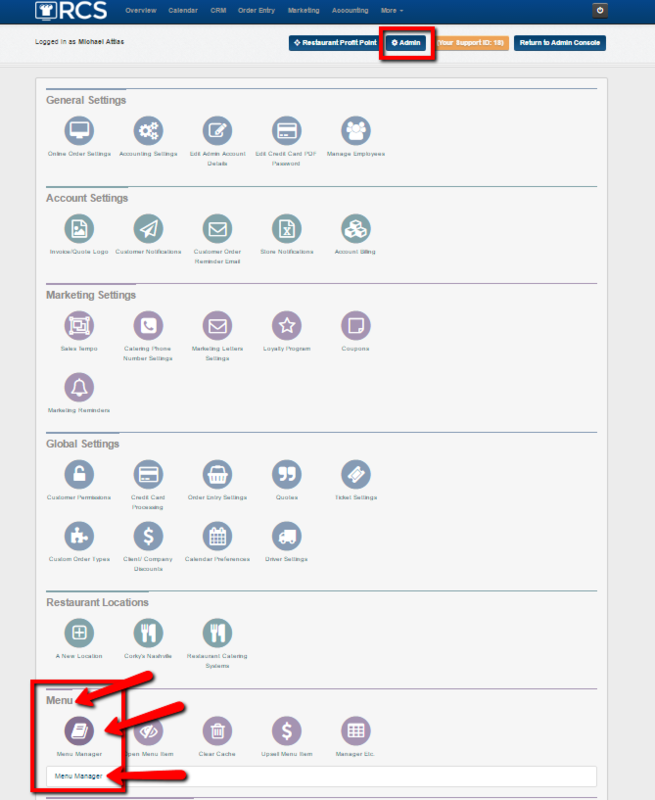 Please note the Menu, Categories and Menu Items (see articles) must be created before you can create a new Menu Item Add On. 2 - You will then see your Menus to the Left of the page and the tabs for: Options, Extras and Toppings tabs to the Right of the page. Extras - A Check Box for an Item that the typically does not come with that Menu Item that the customer may want to add on. 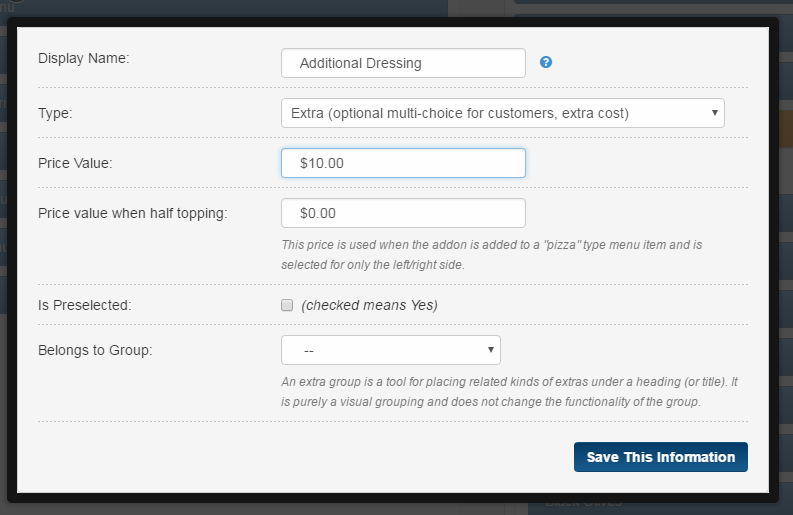 Toppings - A Check Box for an Item that the customer may want to include with the Menu Item. A - Click on the Options tab will open (appear in Orange) and the options we have created for you will appear below. B - Then click on the Create New Option tab. C - A pop up box will appear where you can then create your Option. i. Give your option a name. ii. Option will be pre-selected since that is the tab you are under. iii. 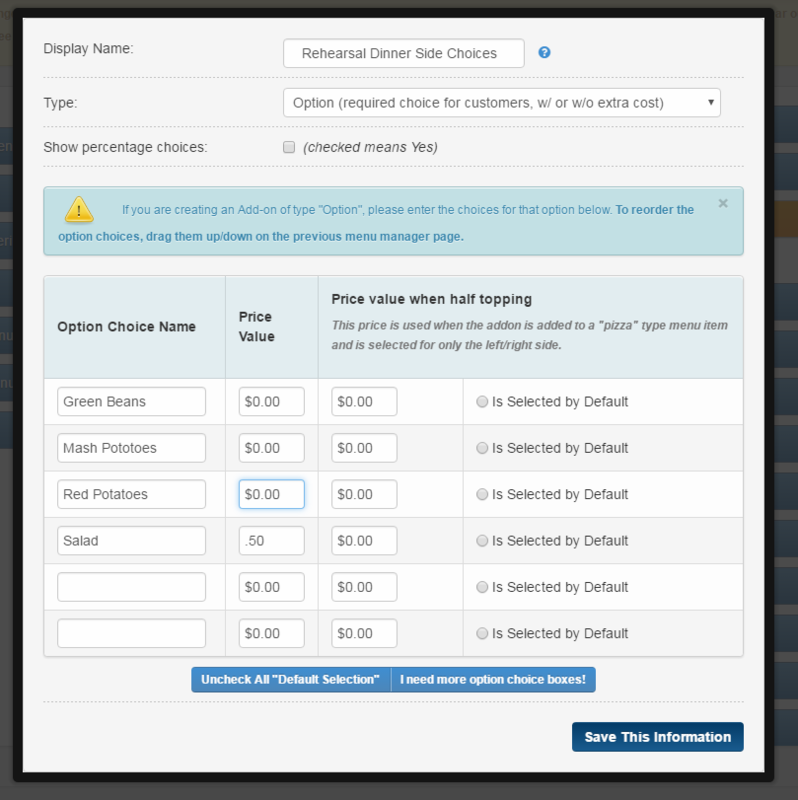 If you want your customer to select how much of the choice they want you can click on Show Percentages. For example: 25% Green Beans and 75% Mash Potatoes. iv. 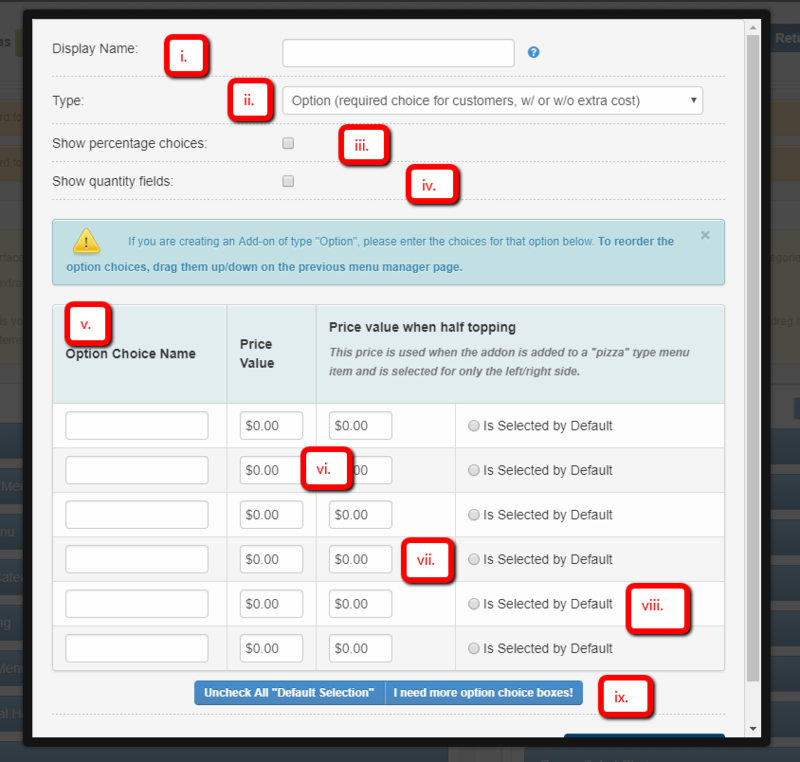 If you want your customer to select the quantity for the number of choices from the options list, you can click on Show Quantity Fields. For example: You have an option named Box Lunch Sandwich choice. The client wants 20 total boxed lunches. As opposed to entering each box lunch sandwich choice as a separate line item, they can define the breakdown. For instance: 20 Boxed Lunches. Customer can do the breakdown as follows: - 10 Turkey Sandwiches, 5 Roast Beef Sandwiches and 5 Vegetarian Sandwiches. v. List the choices under the Option Choice Name. vi. If the choice has an additional charge add it under Price Value. vii. 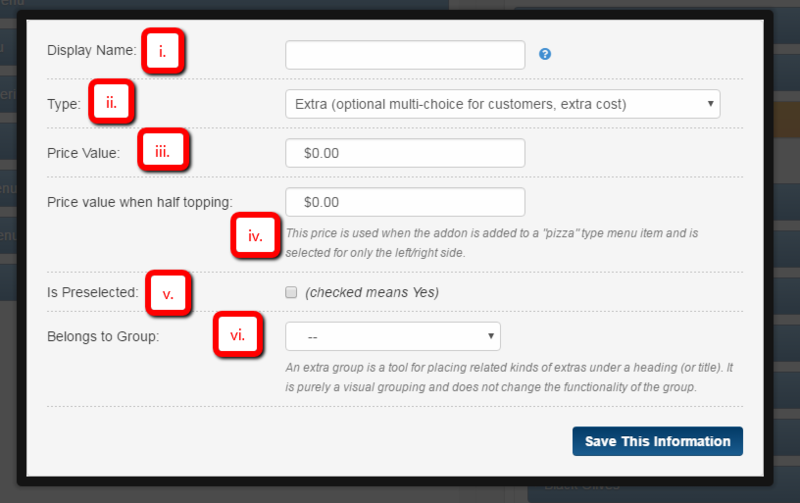 If your option is for a pizza please add the Price Value if the topping is only for half of the pizza. viii. If this choice is the most common choice that the client chooses then you can have this choice pre-selected. So the customer can still change the drop down choice but this choice will be pre-selected. This is great choice when you are asking the client if they want to Add something to the order and one of the choices is No, Thanks. ix. 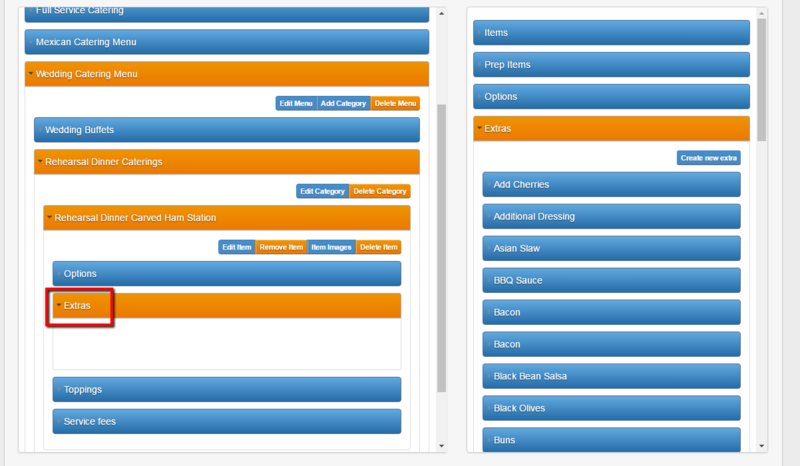 If you need more drop down boxes then you can click on the I need more option choice boxes and more will appear. D - Don't forget to click Save after creating your Option. 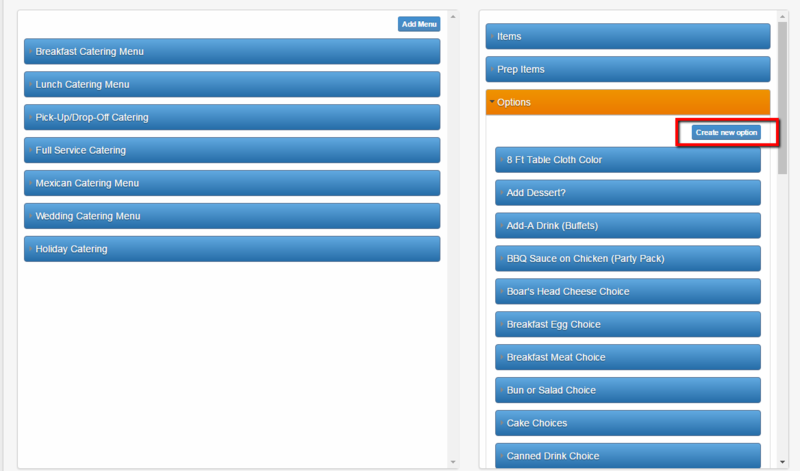 E - You will then need to assign the Option to the menu item. 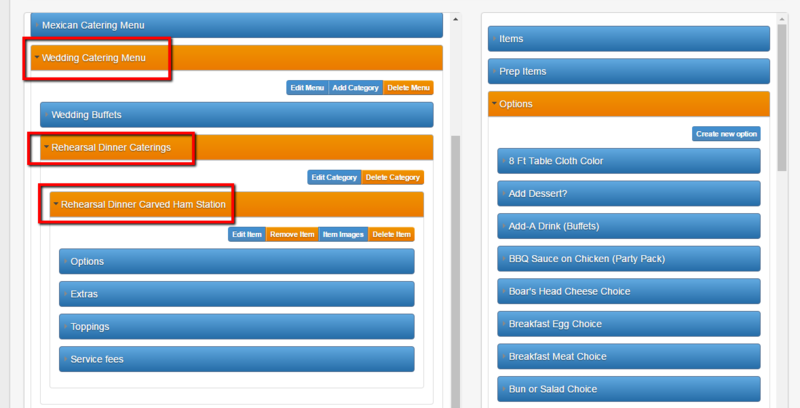 F - Click on the Menu - the Category and the Menu Item the option needs to appear under (once opened will be in Orange). 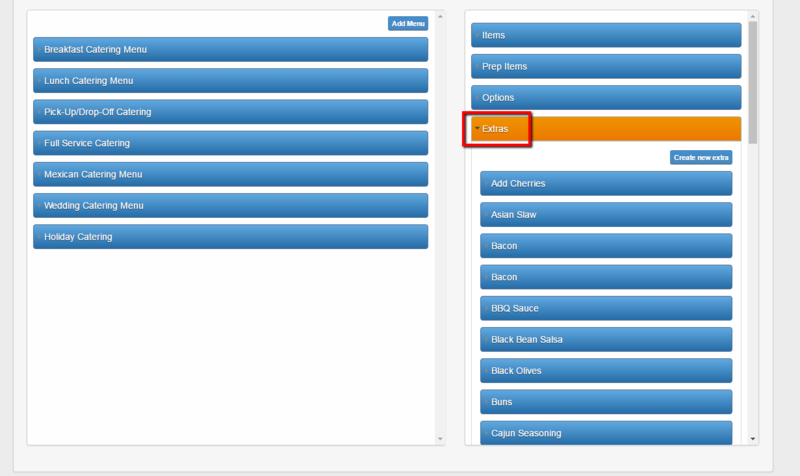 G - Then click on the Options tab that appears UNDER the menu item (on the left side of the page). I - You have now assigned the Option to a Menu Item. 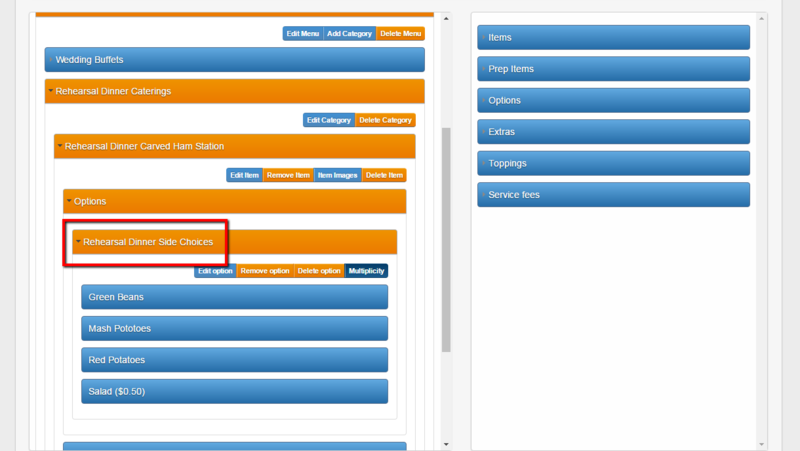 J - If you need the Option to appear more then 1 time (the customer will get to choose 2 sides) then you will need to click on the Option you just assigned to the Menu Item to the Left side of the page. K - Then Click on the Multiplicity Tab. L - A pop up box will appear where you can change the number of times the pop up box will appear. Don't forget to click Save. 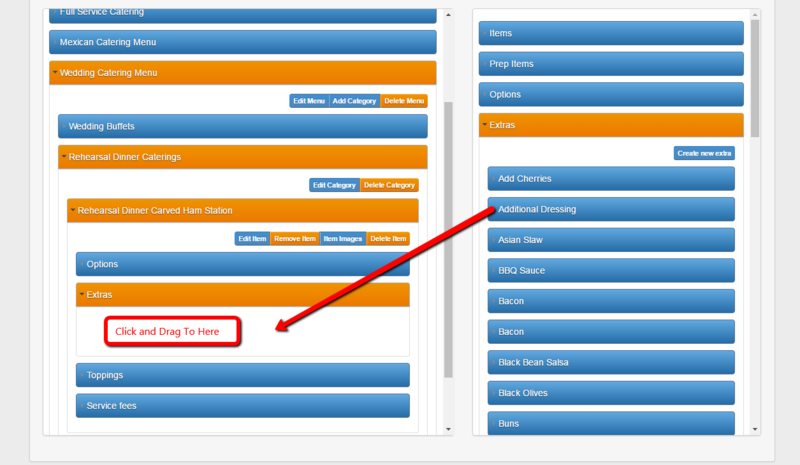 A - Click on the Extra tab will open (appear in Orange) and the extras we have created for you will appear below. B - Then click on the Create New Extra tab. C - A pop up box will appear where you can then create your Extra. i. Give your extra a name. ii. Extra will be pre-selected since that is the tab you are under. iii. If you want you need to charge for the extra add the price here. iv. If it is a half topping (i.e. pizza topping) add it here. v. If you want the extra to be pre-checked off check this box off. vi. 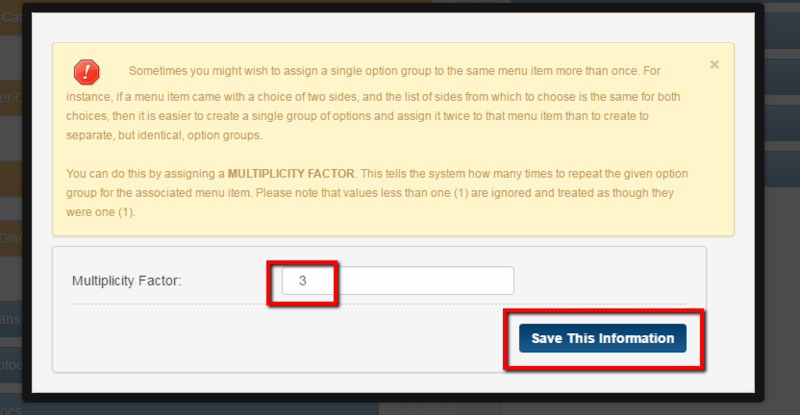 If it belongs to an extra group click the drop down and add it here. E - You will then need to assign the Extra to the menu item. 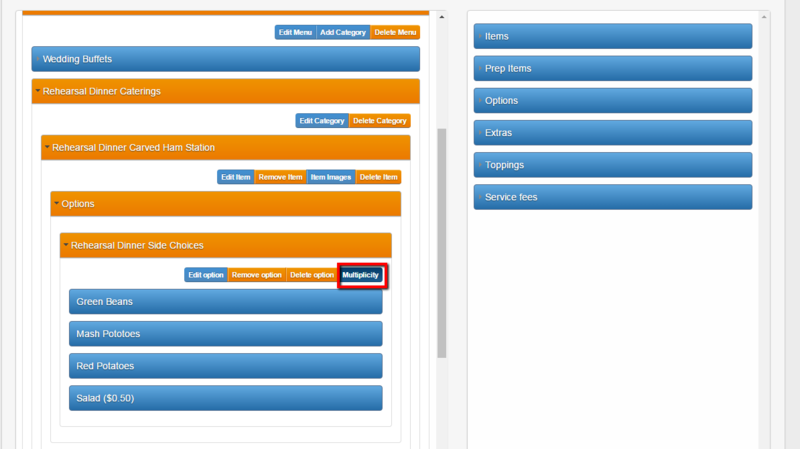 G - Then click on the Extras tab that appears UNDER the menu item (on the left side of the page). I - You have now assigned the Extra to a Menu Item. B - Then click on the Create New Topping tab. C - A pop up box will appear where you can then create your Topping. i. Give your topping a name. ii. Topping will be pre-selected since that is the tab you are under. iii. If you want the topping box to be pre-checked then check the check box here. Iv. Please note that toppings can not have an additional charge. You will need to create an extra tab to have an extra charge included. E - You will then need to assign the Topping to the menu item. 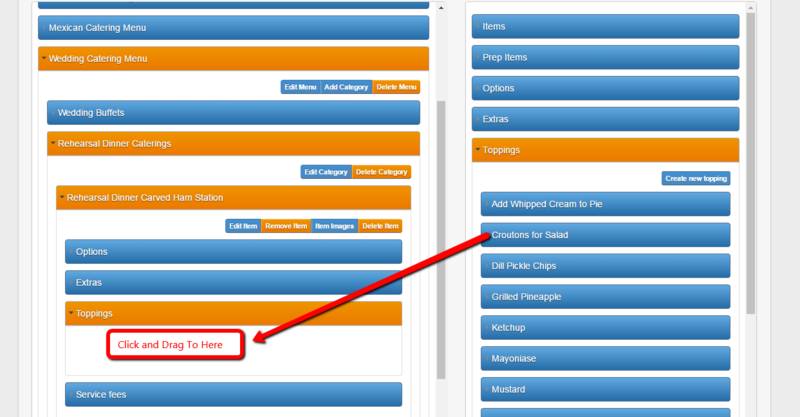 G - Then click on the Toppings tab that appears UNDER the menu item (on the left side of the page). I - You have now assigned the Topping to a Menu Item.